proper welding and brazing procedures are used, this material prevents the possibility of intergranular corrosion caused by carbide precipitation during assembly. can provide additional information on this subject. stresses. 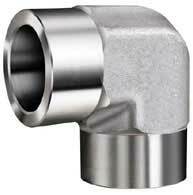 Because of the permanent nature of the seal, weld& braze adapters are frequently used in hydraulic systems with extremely high operating pressures and/or vibration. Size Available (nominal) 1/8" – 2"
Seal Reliability Excellent. Permanently brazed or welded joints are leak-free & high resistant to vibration. Ease of Assembly Difficult. Certified welding or brazing skillsrequired.